A great picture book gives a grandchild and a grandparent lots to look at and talk about. A good picture book for children hardly needs words at all. When the book contains a grandparent character, along with a couple of captivating pets, that's even better! 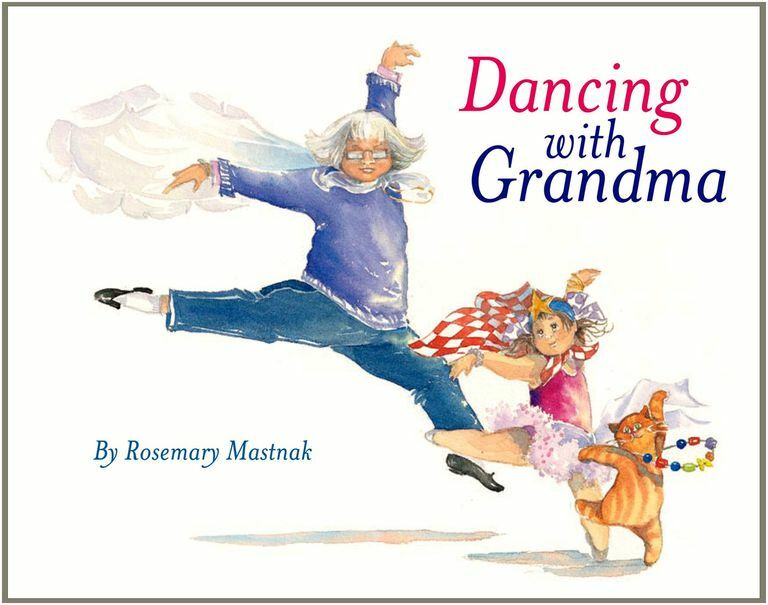 All of these are true of Dancing With Grandma, a beautifully done picture book by Tasmanian artist Rosemary Mastnak. When we first meet Anya, she is deep in a dress-up box, putting together a costume suitable for a dancing princess. When Grandma sees her little princess, she abandons her kitchen chores for an enthusiastic dance interlude that even attracts the resident cat. Eventually the trio frolic into the yard, which is occupied by a giant phlegmatic dog. The dance is so infectious that even the dog is drawn in. After one final ecstatic fling through the living room, the dancers collapse on the couch. In the final drawing, it is night time, and the grandmother is reading to a pajama-clad Anya. The name of the book? Dancing With Grandma, of course! Mastnak's lively watercolors turn this simple experience into a narrative to be lingered over. The grandchildren will love tracing the various objects that figure in the dance and how they transmigrate from one dancer to another, changing function as they go. Grandma's checked dish towel, for example, becomes a scarf, a sash, a cape, a turban and a head scarf before being commandeering by a capering cat. The overall design of the book is impeccable. A yellow ribbon motif accompanies the text as a unifying element. Even the end papers add to the fun, with an implied narrative involving the dog and cat. One final bonus is a picture postcard that comes with the book, perfect for sending to a grandchild with the message, "Remember reading this book?" Besides being beautifully written and illustrated, this book is generously sized at about 12 X 10, which makes it easier to enjoy the art. According to a piece on Kids' Book Review, Mastnak was a latecomer to the business of writing books. She had been an Early Childhood teacher and a watercolor artist specializing in plein air landscapes. Around the age of 60, she suffered a bout of illness, and her doctor ordered three months bed rest. This occurred about the same time that her first granddaughter was born. With time on her hands, she decided to create a book for her grandchild, and Dancing With Grandma was the result. She followed up her first book with Cooking With Grandma and Adventures With Grandpa, which are similar in design and execution, but which offer distinctive charms of their own. Dancing With Grandma is the simplest book of the three, with the fewest words, but that's not a criticism of the book. Instead it makes it almost a textbook example of how a children's picture book should work.